>> DIY In-Ground Trampoline: How to Bury One? Installing a trampoline in the backyard at a ground level is becoming the norm in almost every household. Most of the people are sinking their trampolines into their backyard nowadays. And, this is associated with various advantages. The first one being, they cannot be spotted easily and hence they will not spoil your garden’s look. Moreover, you will not need safety enclosures anymore as the chances of falling from a trampoline that is sunken in the ground are less. In addition, you will not need to move your trampoline from one place to another when you need to work on that particular area. Sunken trampolines are less intrusive, safer and extremely popular. Step 1: The first thing that you have to do is finding out the size of the trampoline and decipher if your garden area has enough space for burying the trampoline. Instead of preparing a small hole for a mini trampoline, you should try to dig a bigger hole for your big DIY trampoline. This is because your kids are not going to be the only ones to enjoy on the trampoline. Even, you are going to exercise on it. Hence you have to consider a larger one. Step 2:Next, you have to mark the place which you want to excavate. This has to be done with accuracy as the hole has to be exact, as per the size of the trampoline that you are going to bury. Also, take care of the size especially if your trampoline is circular. To get the correct radius for the round trampoline, you can mark the place with the help of spray paint so that you get the appropriate radius. Step 3: Now, you can dig the hole in the area you have selected using a mechanical digger or by taking help from the professional hole diggers. You can also do it yourself. Nevertheless, if you are doing it all alone, it might take a lot of time. On the other hand, if you have helpers, you can finish this task in just a week. Ensure that you are not doing it during the rainy season. Pick the dry season for digging the hole. Step 4: Ensure that you keep the soil handy. There are times when the hole becomes bigger than the size of your trampoline. Most of the people make use of the soil to fill up the extra gap. Step 5: Keep in mind that the depth of the hole is equal to the height of your trampoline so that it is exactly at the ground level. Many people advice that if you have your trampoline 4 inches above your ground surface, it will permit air to come out when you bounce. But the problem is that this might cause a hazard. There are chances of your limbs getting trapped or things getting lost under your trampoline. If you want the air to escape when you are bouncing you better make use of the air vents. Step 6: The hole under the trampoline should be able to drain water if you use garden hoses on your trampoline or if it rains. In case your ground remains water clogged, it might not be possible to bury your trampoline. In case you are residing in a place where the water drains very slowly, a soak away can be created at the bottom of your pit by digging a trench. You can fill this trench with gravel, to allow the water to escape easily. Step 7: Ensure that the edge of your trampoline does not collapse. If the soil of your garden is firm, then it is not an issue. However, if the area is sandy, you have to give a support system to make the wall of the hole strong so as to prevent dangerous accidents and injuries. Step 8: When you are bouncing, it is extremely important that the air flows inside as well as outside the hole. Instead of leaving gaps around your trampoline, you can install flexible pipes but make sure that it is installed away from your trampoline. This will allow the air to enter the hole and escape easily. Step 9: One of the best ideas is to try and create a do nut around your sunken trampoline. 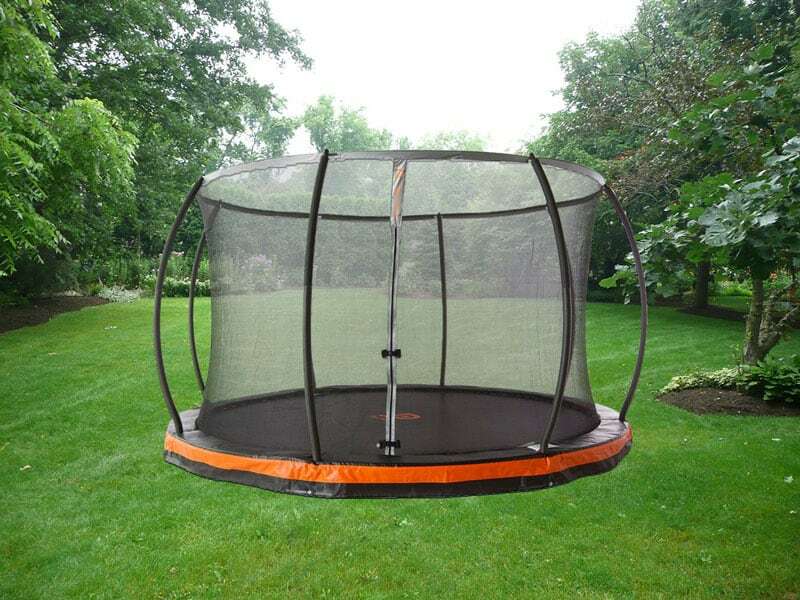 This helps in obscuring your trampoline and makes it easier for your children to have fun and enjoy. Also, it helps in filling out the additional gaps that are there. To conclude, falling off from a trampoline can lead to serious injuries and even death. This is why a do-it-yourself trampoline is best when it is sunken into the ground. No matter how much you or your kids bounce, there will be no risks of falling off from the trampoline. This is why the in grounds trampolines are the best.